Every SW Florida angler knows that snook love to dwell in areas of deep cover. Our thick mangrove shorelines are the perfect habitat for these ambush predators and fly fishing for them is very effective but a bit labor intensive. It requires a lot of accurate casting right at the roots, which also means more than a few flies tangled in the upper branches, too. The payoff is more than worth it. A big snook blasting a fly is one of the coolest things you'll ever see and yanking them out of their cover is a real challenge on light tippets. Even mid size snook, like the 23 incher that local angler Steve Krystyniac landed yesterday, put up a great fight on an 8 weight fly rod. As you can see in the last photo, bulky white flies are really effective on these fish, especially in darker water. I ran up to Palmetto this morning to test drive and photograph the first production model BT Micro. In one word: amazing. 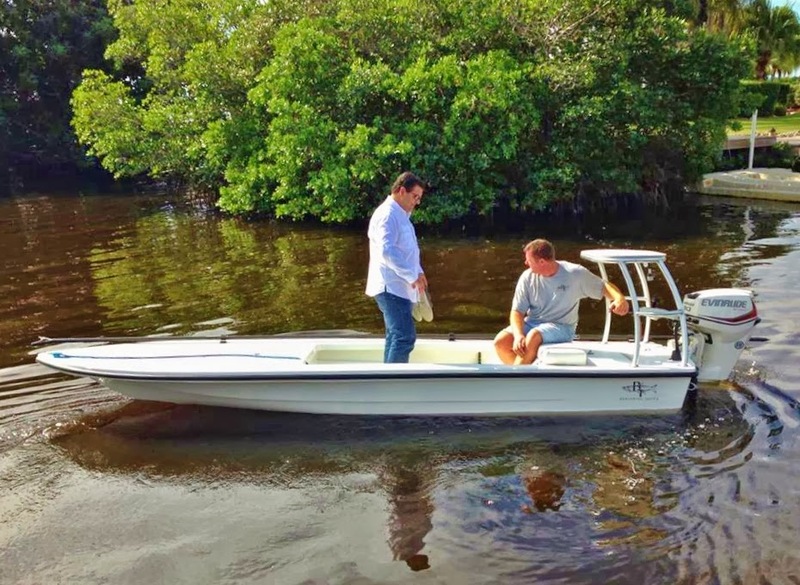 Here are some shots of owners Will and Elizabeth Leslie running the skiff on the Manatee River just after last night's cold front came through and chopped up the surface a bit. The boat jumped right up on plane with only a 30 hp outboard and topped out just under 30mph. It will go even faster with a different prop and in smoother water. Poling the Micro was effortless, especially compared to my 18' BT3. The draft on the Micro is an honest 5" with two people and a full tank of gas. This is basically as shallow as any fish will ever swim. Here's a shot of the Micro back at the ramp next to its bigger brother the 17' Strike. I'll take one of each, thank you very much. These are easily two of the best skiffs ever to hit the water. The Micro is another home run for Beavertail and at $18,000 for the boat pictured below, there's nothing else in its class that can compete with it. Click here to check see the full specs from their website. I've never fished in Venice, but it's photos like this that make my blood boil. That's my buddy Capt. Mike Bartlett of Key West with a 24 pound red he caught two days ago with New Orleans Capt. John Iverson. For the record, I've never even seen a redfish this big anywhere near Pine Island, and probably never will. I've been invited to Venice several times by friends and clients but always with the warning that it will spoil me forever. They actually talk about their reds in terms of pounds in Lousisana, not inches like we do here in Florida. We just don't grow them like that around these parts of the state. Venice is definitely on my short list for next fall, but a few fish like that one would make it really hard for me to ever leave. That's what's kept me away from there for so long. The latest skiff from Beavertail, the 16' Micro, is in production and selling for a base price of $18,000. This includes a tiller drive E-tec 30 like you see in the photo and a Peterson trailer. A side console with hydraulic steering is also available. This is going to be a fantastic skiff and is already selling very well. I'm heading up to the Beavertail shop in Palmetto later this week to run the demo boat and take some more photos so stay tuned. This pair of bald eagles, who I call Fred and Wilma, has been nesting on one of the mangrove islands just north of Matlacha for several years now. They return to the same nest at the beginning of the fall and stay until the end of the spring. The most interesting thing about this pair is that they've managed to produce three successful fledglings for the past three years. From what I've read this is extremely rare for this species. Laying and hatching three eggs is common for bald eagles but the last chick to emerge is often killed by the older two. Mother Nature is tough. Obviously there are some good family dynamics going on for this pair so I'm looking forward to watching them over the next few months. Give me a call if you want to see them for yourself. It’s Mid-October and we've got a lot of redfish prowling the Pine Island flats. Unfortunately, because of the dark water, they're really difficult to spot unless they're tailing at low tide. When you're lucky enough to find them doing this, getting them to eat a fly isn't always a sure thing. That problem begins with the fact that a tailing redfish has already found a morsel of food on the bottom and is actively trying to get at it, usually a small crab digging itself under the turtle grass. That's where the red's attention is focused and it's hard to pull them away from an easy meal. The best way to do that with a fly rod is to show them something even easier to eat. Most flies are designed to land softly on the surface and quietly slip through the water. This isn’t the best way to get the attention of a redfish with its face buried in the mud, which is why I love throwing spoon flies at them. Spoon flies have been around since the 1980's and evolved into several unique configurations. The first ones were made from ordinary tinfoil and a few anglers even used Lee Press-On Nails with great success, but it's the Mylar and epoxy patterns created by Gainesville's Capt. Jim Dupre that are my favorites for their pure simplicity. These flies work no differently than the classic gold spoons that conventional anglers have used to catch all sorts of fish for more than a century. They wobble and flash and generally make a great imitation of a crippled shiner, something irresistible to just about any predator in the ocean. It's that wobble that's especially effective on tailing redfish which normally ignore most other patterns. With their eyes, nose and mouth buried in the mud, reds can still sense movement in the water though their lateral line, the powerful sensory organ that runs from the middle of their head and back to their tails. The vibration of the Dupre Spoon as it flutters by is very effective at tricking them into thinking a crippled baitfish right overhead. That will quickly pull their mouths out of the mud and straight after the fly. The Dupre Spoon is relatively easy to cast on a light fly rod like a 7-weight. They’re a lot more aerodynamic than other spoon flies but when the wind kicks up you'll want to use an 8 or 9-weight to give them some extra punch. 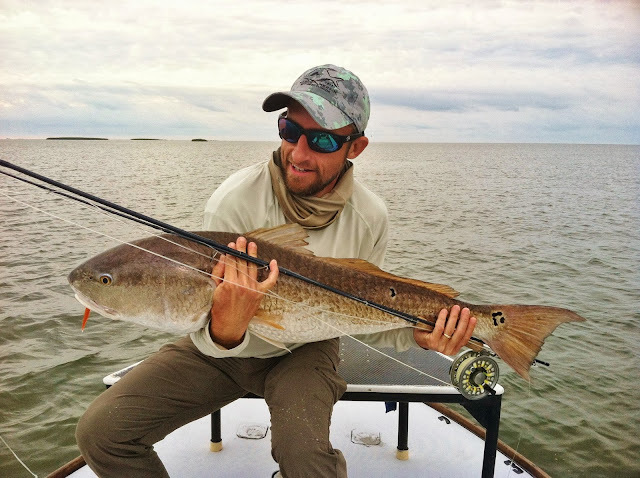 You'll also want to land these flies right on top of most tailing redfish. I actually aim for their heads, or at least where I think their heads might be in the dark water. Yes, this will occasionally spook the fish but most of the time it creates a reaction strike, especially when you're throwing into a school of tailing reds. In most schooling situations, competition overcomes caution and the first fish to see the fly usually eats it. One very important thing about almost all spoon flies is that they're easily made weedless. A simple piece of wire tied at the eye of the hook and extending to the point will slide off most of the grass you'll pull it through on the flats. Every angler knows that a hungry red will still turn away from any lure that's dragging even a bit of vegetation behind it. A small, weedless spoon fly will maintain its action even in the thickest low tide grass. The only drawbacks to the spoon fly is that they're not very easy to tie or inexpensive to purchase. The Dupre Spoon that I like so much retails for around $7 in most shops and online. That's a pretty steep markup for a few cents worth of materials, but in my book it's more than worth it. Getting all of that Mylar and epoxy just right isn't easy and the flies themselves are almost as indestructible as their spin fishing counterparts made of actual metal. Pick up a few Dupre Spoons if you don't have them in your box already. When the reds are tailing in the thickest grass off Matlacha and Pine Island, there's no fly better to throw. I love SUPs, and fishing off of them is a blast. Unfortunately, I rarely have time to do it for more than an hour or two every few months. Chris Lewis from the great website Skinny Water Culture clearly has the time and has taken the sport to an entirely different level. Check out this video of how he's outfitted his paddleboard for overnight fishing trips. Some great ideas here for skiff anglers like myself, too. My two favorite Georgia anglers, Bob and Jerri Francis, came back to the island for a couple of weeks and knocked it out of the park yesterday. I made a five minute run up to the Indian Fields north of Matlacha and we were constantly into the fish. The real highlight was the 33" cobia, a rare catch on the flats around here. Going on vacation with your pets is usually more of a pain than it should be, especially if a fishing trip is part of the deal. If you're coming to Pine Island you won't have anything to worry about in that department. There are several great rental and guest houses that accept pets and I really love having dogs on my boat. Just give me a call and I'll get you pointed in the right direction before you and your pets come to SW Florida. We're just coming off a string of excellent low tides that bottomed out just before sunset in Matlacha Pass. That means lots of redfish pushing across the flats during the last few hours of the afternoon. Just look for the huge swarms of mullet and the reds will be mixed in with them as usual. Local angler Len Favara caught this perfect 26 1/2 fish on a Gulp Jerk Shad around 4PM on Saturday. It was one of three reds he and his son Brian landed with me in addition to several nice trout and one monstrous snook that we hooked but lost after a helpless twenty second battle on 10# Power Pro.